Mufti Shabil Ali passed away (innaa lillaahi wa innaa ilaihi raaji’oon / To Allah we belong and to Him is our return) on Monday 15th April, 1996, (25th Zhul Qadah 1416). He left behind his wife Rashida and two children Ashraf (13 years) and Arshad (11 years). Born in 1956 in Sangre Grande, Trinidad, he attended the Charlieville ASJA Primary School after which he attended the North Eastern Secondary School. At the tender age of seventeen (17), having been actively been involved in the Tabligh Jamaat, Br. Shabil left for India in 1973 where he pursued Islamic studies. During a period of seven years he completed the Maulana and Qari courses at Darul Uloom Sabeelur Rashaad, Bangalore, India. He then pursued a one year Mufti course (1980-1981) at Dabhel Madrasah, Surat, Gujrat, India. During his stay abroad, he became proficient in Arabic and Urdu. In 1978, he married Rashida Adam Ali, daughter of the late Moulvi Adam Ali of Barataria,Trinidad. His missionary zeal took him to various parts of India and Pakistan even while studying. 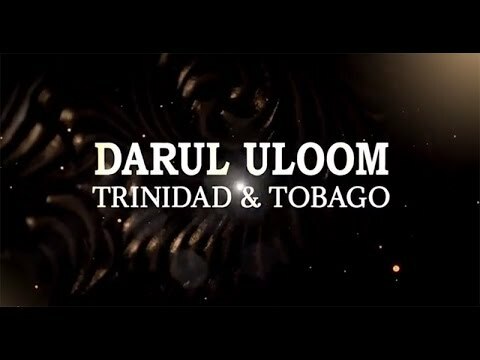 He returned to Trinidad in 1981 and founded Darul Uloom Trinidad & Tobago in 1984. Registered as a limited liability company under the Companies’ Ordinance, it was granted ‘Charitable Status’ by the Board of Inland Revenue. It is governed by an eight-man Administrative Council of which Mufti Shabil was the chairman until his demise. The Head Office of Darul Uloom T&T and its Boys College are situated on a twelve acres spread at Rashaad Avenue, Mon Plasir Road, Cunupia. Three buildings accommodating the offices, library and classrooms, a dormitory, and a temporary kitchen and dining hall have already been constructed and commissioned. A new building presently under construction,however will house the kitchen, cafeteria and dining hall. Construction of the masjid began in March 1996. Mufti Shahil was the principal of the Boys’ College , since its inception at his residence at Rashaad Avenue, Don Miguel Road, San Juan. The Boys’ College now has an enrollment of one hundred and twelve (112) full-time students includimg foreign students and a staff of seventeen (17). Having relocated the Darul Uloom Institute to Mon Plasir Road, Cunupia in 1986 he initiated the Darul Uloom GirIs’ College at his home in 1989 with himself as the principal. His wife, Rashida was appointed principal of the Girls’ College in 1994 after having successfully completed the two-year Alim programme. Now in its seventh year of operations the Girls’ College has an enrollment of seventy-five students and a staff of seven. Both the Boys’ and the Girls’ Colleges provide a five year programme for seven O’Level subjects and an intermediate course in Islamic studies. Students are accepted after writing the Common Entrance Examination from the age of eleven years. Upon successful completion of the five-year programme, students both male and female, have the option to study for a further three years to graduation Higher Islamic Studies as well as to pursue studying Computer Studies and the following A’Level subjects: Arabic Language, English Literature and Economics. A Mufti Course is also offered. Since his return to Trinidad, Mufti Shabil was actively involved in educational pursuits. His publications include seven books on the topics related to the teaching of Arabic, Tajweed and Islamic Studies for children. His unpublished works span a wide range of Islamic Sciences such as Tafseer, Hadith, Islamic History, Islamic Beliefs, Islamic Inheritance and Islamic Jurisprudence. Certainly, Mufti Shabil’s scope of activities went beyond the walls of Darul Uloom. He developed a close affinity to the Muslim Credit Union which was established in 1983 and continued to be its Shariah advisor. His role in the forging of Muslim groups and the founding of the United Islamic Organisations of T&T (UIOTT) was no insignificant one. As representative of the Darul Uloom to the UIOTT, he served as Chairman of the group for two consecutive years. He was a member of the Unity Dialogue Committee comprising of representatives of UIOTT and the Muslim Co-ordinating Council – an umbrella body made up of the Anjuman Sumatul Jamaat Association (ASJA), Tackveeyatul Islamic Association (TIA) and Trinidad Muslim League (TML). Mufti Sbabil was a teacher, a counsellor and a friend to all who sought his guidance. He will certainly be missed by many for a long time. “He has made a significant contribution to the propagation of Islam in the Caribbean, and while the Institution he founded is far from completion, it began bearing fruits during his lifetime.” Dr. Waffie Mohammed, Director, Muslim World League Regional Office. Be the first to comment on "Mufti Shabil Ali (ra) [1956-1996]"